In a letter to the editor in the morning paper that I subscribe to, the East Bay Times, a reader wrote something to the effect, “On Thanksgiving we give thanks to God for the things in life we have, and the next day, on “Black Friday”, we kill anybody who gets in our way of a bargain!” Now there’s a writer who needs to be heard from! Anyway, I headed over to San Francisco today to be a part of it. “Black Friday” isn’t a bad day to try to get into the Christmas spirit, just as long as you’re not shopping! This is Market Street looking east from Stockton Street circa 1900. Three buildings can still be seen today. First and foremost, the crowned Call Building on the right, remodeled in the late 1930’s. On the left is the Gothic looking Mutual Savings Bank Building with its green and red roof. Just behind that is the brownish-red Chronicle Building. The clock at the top of the building was destroyed in 1905, the year before the 1906 Earthquake and Fire. To see the town the way it used to look long ago, that’s what I like the best about working on this blog. The old Gingerbread Cliff House that burned down in 1907 from a rare angle: I’ve been trying to get a good photo of the Cliff House from Sutro Heights for a long time now. Trees block most of the view of the restaurant from the top of the park today. However, earlier this week I found a trail that winds part of the way around the side of the cliff. It can be dangerous if you’re not careful and there’s evidence that homeless people have been sleeping there, but it offers a view of the Cliff House that not many people can see anymore. Although there’s an abundance of material, I couldn’t seem to come up with any picture taking ideas throughout the week. I can’t call it “writer’s block” because I’m not particularly a good writer so I’ll call it “photographer’s block”, although my skills there are open to debate, as well. Anyway, I decided that a nighttime prowl through the City, like ‘The Shadow’ would open up some possibilities. “Who knows what evil lurks in the hearts of men?’ I said to myself, like ‘The Shadow’ does, as I moved through San Francisco from twilight to dark, but all I saw were friendly and happy people. San Francisco, like Disneyland, is two different places day and night, although, I suppose you could say that about anywhere! Sometimes when I visit places in San Francisco at night that I’ve been to dozens of times in the day, it’s like seeing them for the first time. Speaking of the Balclutha, here she is docked at Pier 43. Also, here’s something I didn’t know until I researched the Wikipedia entry on her, the Balclutha was filmed in a scene in the 1935 movie ‘Mutiny on the Bounty’ with Clark Gable and Charles Laughton! The Barbary Coast Trail walking tour, established in May of 1998, was created by the San Francisco Historical Society and historian Daniel Bacon, a member of the society. It follows north to south, from Aquatic Park to the old U.S. Mint Building on 5th Street, or south to north from the Mint to Aquatic Park, whichever is preferred. It trails through much of old San Francisco, and at times travels along the original shoreline. The entire trail can be followed on the old McQuillan map from 1878 below. Our tour will follow the south to north route. Some references suggest that you can take this tour all in one day. I broke it up over three days and I still felt old and tired when I finished, although, I enjoyed every step of the way! So put on some comfortable shoes and kick back, you’re in for a long armchair walk! Along the way, you’ll spot gold medallions placed in sidewalks along the trail like this one at the Mint Building. The medallions have an arrow pointing toward the direction of the Barbary Coast Trail. I’ll have more on these later in the post. The trail crosses Market Street and heads up Powell Street to Union Square. The cable cars at the Powell Street turntable were temporarily shut down when the vintage picture was taken. The photo looks like the 1970’s so I don’t think that this was during the big shut down from 1982 to 1984. We’re now at Union Square across from the St. Francis Hotel. The tour crosses Union Square, seen here just after the 1906 Earthquake and Fire, and enters Maiden Lane. Moving through Maiden Lane we turn left onto Grant Avenue. Maiden Lane, once called Morton Street, was an alley filled with brothels before the 1906 Earthquake. Along Grant Avenue we’ll cross Sutter Street where the old Whitehouse Department Store was located. Our view is from Sutter Street looking east toward Grant. At the next block we arrive at the official entrance to Chinatown at Bush Street. In 1983 I took the top picture looking back down Grant Ave. toward Sutter Street. The Whitehouse Store had not yet become the Banana Republic. We’ve entered Chinatown and we’ll head north past where the old postcard was taken. The trail moves into Waverly Place, seen here from Clay Street in 1938 when a cable car line ran along Clay. From Waverly place we’ll head into once notorious Ross Alley, long ago famous for Shanghaiing, Tong Wars, and prostitution cribs. Seen here in Arnold Genthe’s vintage photo from before the 1906 Earthquake and Fire, the alley is quaint and peaceful today. The building the gentleman is looking into in my picture is the Golden Gate Fortune Cookie Factory where you can have your own fortune baked into a cookie. From Ross Alley we’ll double back to Washington Street and Grant Avenue. The medallion on the northwest corner of this intersection has two arrows. These are the medallions placed between the two origination points of the Barbary Coast Trail directing visitors traveling either north along the trail or south. The trail passes through the old Portsmouth Square. We are now in some of the oldest settled areas of San Francisco and near the original city shoreline. The vintage photo is another Arnold Genthe picture taken at Portsmouth Square. Let’s head down to Montgomery and Clay Streets, where the old Montgomery Block, a hangout for writers and poets, was torn down at the end of the 1950’s. The Transamerica Pyramid building, seen from Montgomery and Clay Streets under construction, occupies the location of the old “Monkey Block” today. Now we’re on Pacific Avenue, the street that epitomizes the “Barbary Coast” more than any other street in San Francisco. “Blackie” Norton’s Paradise Saloon from the 1936 film ‘San Francisco’ was on Pacific Ave. Nick’s Saloon, from William Saroyan’s play ‘The Time of Your Life’ was on Pacific. Just about every old movie about San Francisco before the 1906 Earthquake is centered around or mentions Pacific Avenue. In the 1940’s and 1950’s it became the ‘International Settlement’ the center of San Francisco’s wickedest nightlife. The two posts that held up the International Settlement sign on Pacific Avenue at Montgomery Street are still there today. We’re going to turn north onto Columbus Avenue from Pacific and head north, or more accurately, northwest. Look back at the old Sentinel Building, also known as Columbus Tower, completed in 1907. The vintage picture is from the Charles W. Cushman Collection. We’re going to travel along Columbus Avenue, seen here at Columbus and Stockton Street, and head toward Washington Square. I couldn’t get the most accurate lineup with the OpenSFHistory picture because of the construction, but you can still see the steeples of Saints Peter and Paul Church in the background of my picture. Washington Square at Saints Peter and Paul Church: The famous San Francisco Chronicle columnist Herb Caen once quoted something to the effect, “Washington Square, which is not a square, has a statue of Benjamin Franklin not George Washington, and is located in North Beach where there is no beach!” From Washington Square we’ll head up to the top of Telegraph Hill. A 1926 picture from the Shorpy Historic Photo Archive shows the old urn balustrade that circled the parking lot where Coit Tower is today. The balustrade was considered unattractive and removed by the end of the 1930’s. We’ll head back down Lombard Street from the top of Telegraph Hill. In October of 1983 I took the above two pictures of the Parade of Ships for Fleet Week from here on Lombard Street when there was a greater navy presence for the occasion. These are two perfect photos for today’s November 11th posting. From Telegraph Hill the Barbary Coast Trail takes you down to the Embarcadero, probably my favorite street in San Francisco. There’s just something magical to me about the shipping history, the fog, and the film noir like setting of this street. The foggy vintage picture is from the great photographer Fred Lyon. We can’t pass by here without stopping at the Fisherman’s Wharf Boat Lagoon. The vintage picture is on the wall of Alioto’s Restaurant, seen in both photos. We’re nearing the end of our journey. These two photos were taken at the Hyde Street Pier from the ferryboat Eureka looking over to Aquatic Park across the 1895 schooner C.A. Thayer. The top picture is from a slide I took in 1985 from the third deck of the Eureka. Yesterday’s photo was from the second deck, the third deck being closed off now. The trail ends (and begins) at Aquatic Park. We’re looking at the Hyde Street Pier from behind the Maritime Museum. My 1985 slide looks very similar to the picture that I took yesterday. The 1886 square-rigger Balclutha has been relocated to the Hyde Street Pier since my 1985 picture but is temporarily away from the pier in dry dock for repairs at the current time. We’ll end on the steps behind the Maritime Museum. I don’t remember what was going on in 1985 when I took the top slide picture, and I don’t know who the girl dancing was, but it must have been a fun day! This is an update of a post that I did in April of 2016. I was up on Potrero Hill today getting some new pictures and I talked with a fellow named Franklin who lives on the hill. He’s an avid photographer and history buff, and it was a pleasure to meet him. On the eastern side of the hill on the corner of Mariposa and 3rd was the Strand Service Station. The Mission District, and at its southeast side, Bernal Heights are two areas of San Francisco that I don’t explore as often as I should. The views from Bernal Heights are among the best in San Francisco. Of course, it’s always recommended that you stay on the walking paths. Still another accident, this time at 24th Street and Potrero Avenue: They needed to be more careful around here during the 1940’s! The person in the back of the ambulance being rushed to the hospital wasn’t having a red letter day! It may have been “leisure time” for the people in the vintage pictures, but the traffic, crowds, and the fog on the Saturday before Halloween made it less of a leisure time and more of a labor of love for me. Still, I’ll take any day “out in the field” in San Francisco over a day in the office anytime. 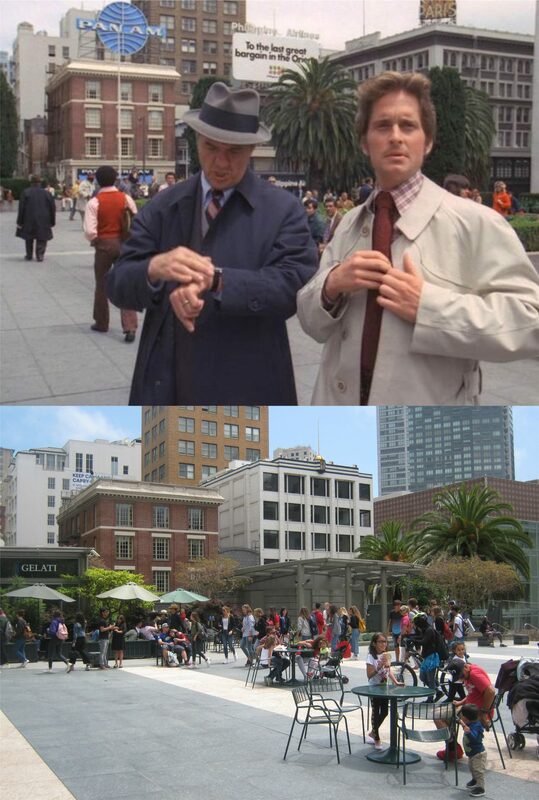 So come along with me, and we’ll find some relaxing things to do around San Francisco before the cold days of fall arrive. How about lunch at Fisherman’s Wharf, and a stroll around the boat lagoon with these three ladies, whoever they were? There are a lot more buildings on Russian and Nob Hills now, but you can still see all of the ones in the vintage picture in my photo. We’ll head out to Ocean Beach around 1972. Hope I can get the Cliff House in my picture through the fog! It wasn’t a bad attempt as far as bad attempts go, especially considering that you couldn’t see the Cliff House half the time. There’s some really strange looking people in that early 1970’s picture, particularly the lady with the child in the center. I have no idea what kind of a beach outfit that is! This was at the time that the Cliff House was painted blue with ocean waves around the top. Or, maybe, a leisure stroll through the “Oriental” Tea Garden is your cup of tea. The vintage picture is where the old entrance used to be to the Japanese Tea Garden, you can see it in the background of my photo. There have been a lot of changes to the landscape in the garden since the name was changed to the Oriental Tea Garden after Pearl Harbor. The original name was restored in 1952. We can spend to a pleasant afternoon listening to music in the old Music Concourse in Golden Gate Park, and then wander over to the DeYoung Museum; except, there’s never a band playing there when I visit. That’s the old art deco museum during the 1920’s. Well, if you’d like to ride the Sky Tram behind the Cliff House or ring the bell at sunset in the Redwood Dining Room we can hang around here for awhile! I never rode the Sky Tram, but I did listen to them ring the bell at sunset when the sun disappeared behind the ocean horizon quite a number of times. Would you like to do some shopping at the Cliff House Gift Shop? I know, there were a lot more items to choose from long ago, but it’s not a bad little shop today and I almost always buy something when I go in there.